Cliff Jarvis | Confident. Returns. - Part 3 Cliff Jarvis – Page 3 – Confident. Returns. It seems we have forgotten about bonds with the stock market in full boil. The bond market is almost twice the size of the stock market and it is about to post one of its worst years in a long time. Over the last decade, interest rates have dropped below the long-term average of 5% to 1.4% for the 10 year Treasury. Furthermore, short-term rates on money market funds and C.D.s are almost zero due to the Zero Interest Rate Policy of our Federal Reserve. Of course, when interest rates go down, the price of bonds goes up and the long trend of lower interest rates since 1981 made bonds a good investment. However, this trend has hit bottom. Like holding a ball under water, interest rates are popping upwards. The interest rate on the 10 year Treasury has almost doubled off of the May low to the current 3%, and this is still below what many consider normal. Therefore, the price of bonds has now been declining due to rising interest rates. Their meager interest payments have not been enough to compensate for the damage. Leading bond funds are sporting total returns of 0 to minus 10%. The dilemma is that bonds and money market funds are an important theoretical part of any proper portfolio. This is especially true for the investor concerned about what the extreme volatility of the stock market can do to one’s life savings. *Since I wrote this 2 days ago, the stock is off almost 20%. To start, let us assume that we are not in extraordinary times (link). Assume that we are in normal times, that the economy is fine. The first concept is the Price/Earnings ratio. It compares a stock’s 12-month trailing earnings over the current price. For example, currently a major U.S. car company’s P/E is 12x and a cell phone equipment company is 18x. The P/E difference is due to the expected future earnings growth of the cell phone company being higher than the car company’s. Therefore, the higher the future prospects for a company, the higher the P/E ratio of its stock. Next is the PEG ratio. The PEG ratio is the P/E ratio over the expected growth rate in earnings. A company that is 15x earnings which is expected to grow earnings at 15% has a PEG ratio of 1 (This is considered fair value, some would argue for a higher number). Below 1 (or 2), the stock is cheap, above …expensive. Yahoo finance is an excellent webpage to find this out and more on almost all stocks. Lastly, because earning can be volatile, a leading economist, Robert Shiller developed the Cyclically Adjusted Price Earnings ratio (CAPE10). This ratio is based on average inflation-adjusted earnings from the previous 10 years instead of just the last trailing 12 months. It is believed to be a more accurate measure. Of course, due to a cornucopia of various factors, the CAPE10 ratio is a poor predictor of short-term movements in stock prices (and there is certainly no shortage of various factors lately). Lazlo Birinyi well documents this (he continues to call for higher prices). However, over the longer term, I believe the inevitable gravity of fair value pulls on prices (link). What is the current CAPE10 ratio on the S&P 500 you ask? Stocks, Value, and the Economy. There has been a historic intervention into the economy by the central government. Huge deficits were incurred. The U.S. Treasury and its partner, the Federal Reserve engaged in massive money-creation, buying (QE) all this debt. Essentially, the government loaned itself money; as much as it wanted and more. Interest rates collapsed to never seen before levels (0%). We were told this would find its way into the real economy and economic prosperity would return. So far, it has not. The financial sector and their cabal have benefited from this debt/financed binge of cash flowing to them but high unemployment remains and wages are downs. Trickle-down economics has yet to take hold this time. Clearly, the economic backdrop is not good. Yet the U.S. Stock market is up. Reasons vary. Government deficit spending has replaced the tapped out consumer’s borrow & spend binge. This has maintained corporate revenues. Lower than low interest rates allowed corporations to refinance debt and add to earnings. The central banks newly created money has flowed into the stock market; boosting prices. However, up is up. Although valuations are rich (link), especially given the economic backdrop, they may not be in bubble territory. Lazlo Birinyi still firmly holds that the time-proven rhythm of the U.S. stock market points up. And this is America. Great technological strides are being made; such as Apple’s harnessing and slick packaging of personal digital devices, Ford’s remarkable progress manufacturing fuel-efficient EcoBoost engines, the dramatic reduction of electricity used by LED lighting, or direction drilling reducing carbon emissions and making us energy independent to name a few. Therefore, as we go into the Fall, U.S. growth stock funds are up about 16.0%, but emerging market funds are down about 13%, Intermediate-term bond funds are down about 4.0%, and money market funds pay next to nothing. This leaves a diversified portfolio up maybe about 6.0%. This is a respectable return, but not what the headlines lead the average investor to believe. Now, all eyes are on what our government will do with interest rates (QE and its tapering) and how this grand experiment will end. I have been writing, talking, and even ranting about duration, ultra-low interest rates, and the inevitability of higher rates and thus, lower bond prices (link). However, rates kept driving down to historic lows. But maybe it is finally time. The interest rate on the 10-year Treasury rose off the bottom of 1.7% in May and broke through a 7-year trend line to 2.7%, as of this writing. Bonds prices dropped dramatically (link). Our government needs to hold interest rates down to avoid the compounding effects of higher interest payments on the existing debt. In addition, our government needs to hold interest rates down until growth is strong enough for the economy to stand on its own. Their plan is to create new money, buy bonds, and keep interest rates low until the economy revives (Quantitative Easing). Inflation will then pick up along with higher wages. Deficits will subside due to higher taxes from a growing economy. Total debt will shrink in real terms due to controlled inflation, and interest rates will rise slowly. That is the plan. They will do whatever it takes….which is to print money and buy bonds. The Fed simply cannot stop. Interest rates must stay down. But so far, little of this money has found its way past the stock market into wages. Hence, there is no growth. Their plan is not working. GDP is growing at about an anemic 1.5% so far this year (link). I see no economic strength driving rates higher. The unemployment reports have not been positive. Full time, breadwinner jobs ($35,000+) are scarce and other employment measures are not good. The economy does not point to higher interest rates. The Fed has no reason to stop its Quantitative Easing maintenance of low interest rates. However, the risk of principal loss has shown itself. Maybe something else is at play. Maybe with dividend yields so low, it is not worth the risk. As always, it is not easy to see forward. The stock market is running. The economy … not so much. So what is going on? In a perfect world one invests in the stocks of well-managed companies that are growing sales and earnings in a sound and strong economy. However, this bull market is not that. Yes, well-managed companies are growing sales and earnings. Yes, the price of the stock market relative to its underlying earnings, although rich, is not excessive. However, it is not a sound and strong economy. What is driving this market is: liquidity. Our Federal Reserve is pushing a reported $85 billion of newly created cash in the banking system every month and dropping interest rates to near zero. Much of this new cash is buying stocks. Also, savers that are faced with near zero CD rates, are searching for some return and buying dividend stocks. Furthermore, the European Central Bank appears to be no longer backstopping their citizen’s bank deposits. Money is moving out of Europe and finding a home here (Link). Japan with its aggressive yen devaluation plan is also a benefit to our stock market (Link). Robust inflows of cash are driving this stock market higher without concern for the economic uncertainty all around us. The psychology of Birinyi’s bull market cycle is in full swing (see below). The stock market is running. Up is up. What is behind the Italian elections? The introduction of a common currency, the Euro, created a potent cocktail for the less industrialized nations involved, especially the Mediterranean countries (including France). It allowed the highly efficient industries of the northern European powerhouses countries (Germany) to compete with their southern brothers on equal footing. The southern nations, with their relaxed lifestyles and less than robust industrial infrastructures, were unable to compete. Before the Euro, they were able to devalue their currency and thus lower the price of their goods (in terms of their competitors currencies). However the Euro locked them in. Instead of facilitating trade, industries in the south were outcompeted and hollowed out. Imports grew while exports shrank. Goods imported from Germany were increasingly being financed with more and more debt, not earnings. (Un) Fortunately, because the southern brother’s currency was now the Euro and devaluation was not a concern; banks everywhere were willing to lend these nations money with abandon. While exports (earnings) and thus their private productive sectors declined, governments of these southern nations bloated up to fill the void left by their declining productive sector. Government, which of course earns nothing, financed itself by borrowing even more money. Government expansion maintained the illusion of economic activity. The problem was solved for a while. So here we are now. The southern Euro nations have a shrunken and uncompetitive productive sector burdened with a huge government, and an enormous debt which cannot possibly be paid back. Austerity, or ‘internal devaluation’, is being pushed on them by the northern banking/political class. They want their southern brothers to start ‘living within their means’. However, as Milton Freedman proved, it is easier to spend more than it is to spend less. A gradual devaluation used to keep things in check, no longer. Now the northern Eurocrats are trying to hold back the inevitable by forcing their southern brothers to cut wages, employment, and benefits to kept the euro intact. The Italians are pushing back. Watch Italy. I think Europe may devolve into class warfare. The Euro is a failed experiment. Furthermore, it is a warning to others that a debt financed, bloated government is not the solution. The preliminary Gross Domestic Product for the 4th quarter of 2012 printed minus .01%. That is not good. True, looking at the individual components shows some upside. Consumer spending grew 2.2%. Housing advanced off a low bottom. Tech spending was up. Inventories and exports fell while government spending, which needed to decline, did. However, our Government still borrowed a huge amount; $312 billion in the fourth quarter alone. (link). Overall, 2012’s GDP was about 2.2%. That is not good (link). Yet the stock market looks to continue to rally. Is the market wrong? No. Up is up. Lazlo Birinyi, a veteran market historian to be respected, argues that bull markets have cycles. He breaks these cycles into four stages: Reluctance, Consolidation, Acceptance, and Exuberance. These cycles are driven by psychology and play out despite other factors. Of course, a major event will dominate. However, desperate U.S. Government policy and the failing economic recovery, the debt tsunami in Europe, or the Arab spring have not broken this cycle. Birinyi remains positive for 2013. He believes the fourth stage of Exuberance began last July. Furthermore, his analysis shows that, historical bull markets he sees as similar to today’s resulted in a 38% average gain. Part I: Ignoring the Fundamentals? Is The Fiscal Cliff is now behind us? Not 6% of the total debt, not 6% of the Federal Budget, but just 6% of the $1 trillion-plus deficits to be incurred in each of the following years. Moreover, this assumes that revenue (taxes) meets projections. Remember that the rich are also the successful and have proved adept at changing behavior to manage their tax bill. So, the answer is: no. The Fiscal Cliff is still very much unsolved. Furthermore, a measure of how expensive stocks are relative to earnings is the Shiller Price/Earnings ratio. It is above historic averages at 22x’s. This generous premium surely signals good times are soon to appear. Or are they? Chart after chart of economic data still shows little sign of this. So what’s up? This stock market is on a liquidity-driven rocket ride as the U.S. Federal Reserve mints new dollars from nowhere to accommodate the massive debt binge of our Government. Currently, our Federal Reserve is purchasing $85 billion of bonds per month to maintain our record low-interest rates. This is $1 trillion per year compared to U.S. GDP of about $16 trillion. It is estimated that 42 cents of every dollar spent by our Government is borrowed (link). All this liquidity pumped into the system by not just our Federal Reserve but, by the Bank of Japan, and European Central Bank, is driving stock prices with no apparent end in sight. This market is on a rocket ride. This news is not new. It was the case a year ago when I was recommending caution. It seems nothing has changed. Our government is still irresponsible, the economy is still mired down, the Euro is still a bankrupt idea, and the stock markets continue to go up. 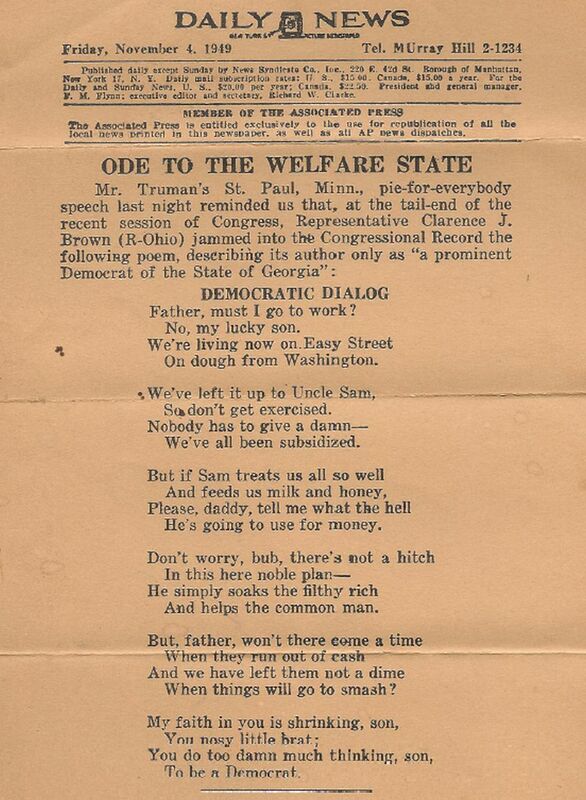 After proofing the above for me, one of my managing partners sent me a copy of the Daily News dated 11/29/1949 titled “Ode To The Welfare State”. This article foretold the end of American prosperity. It reminded me that our Country has been here before and survived to scale to new heights. He also reminded me that there are currently many highly successful companies driving their stock prices higher. Laszlo Birinyi, a veteran market historian to be respected, was right last year and is still bullish. His recommended portfolios were up 3%, 7%, and 15% for 2012. He chooses his words carefully and, is very positive for 2013 (link). Birinyi’s newsletter is provided to me by my other managing partner. It is no secret that our Federal Reserve is ‘managing’ interest rates in an effort to generate economic growth. Many argue that this policy is unsustainably suppressing interest rates and that the free market or ‘correct’ level of interest rates is much higher. Predicting and timing moves in interest rates is a “fool’s errand”. The world is full of turmoil. U.S. interest rates could remain low for an extended period. However, government policies often fail and interest rates could spike upward. This would leave many investors with unexpected losses. One must consider that current dividends may not be sufficient to pay for the potential risks. Caution is recommended.